Hong Kong is feeling the Art Basel glow. Here’s what to do this week. Art Basel is arguably one of the biggest events of the year in Hong Kong and definitely the city’s largest art event! Returning on 29 March, for its annual three-day takeover of the Hong Kong Convention Centre, there is going to be a vast amount to see and do. As excited as we are for our annual mad dash attempt to see every piece of artwork (they say it can’t be done, but we’ll believe that on the day we give up trying), there is actually a lot going on in HK outside of Art Basel. Feel the Art Basel glow with us and explore the rest of the city’s art events. Read on to find out what else is in town. What: If you read our recent This Week in Travel, this event should be of no surprise to you. KAWS is taking his signature character, Companion, on holiday. Companion – who you can think of as a rather grim Mickey Mouse – will be enjoying a bit of a float or perpetual snooze in HK’s famed harbour. What: Watch the art be created as you walk the streets of Wan Chai. HKWalls is taking over Wan Chai with local and international graffiti artists colour-fying the district’s walls and alleys. Check out HKWalls Facebook page for locations, times and updates! 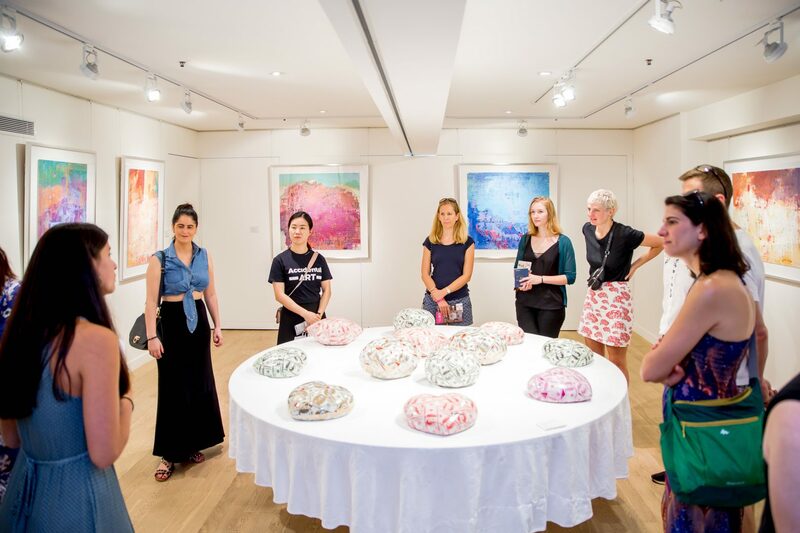 What: If you love a drink (whether it be champagne or coffee) in your hand as you network your way through a maze of artwork, then the Hong Kong Art Gallery Association’s Art Gallery Night and subsequent Art Gallery Brunch are for you! With tons of different locations and refreshments to enjoy, you’re bound to find something that suits your tastes. Click here for the complete list of galleries and times. What: Art Basel’s less luxe older sibling (or more relaxed sibling, however, you want to look at it), Art Central is back. For its fifth year, the art show will be welcoming work from 107 galleries representing 22 countries. Art Central is best loved for its live performance and interactive art – and this time around you can expect a cup noodle restaurant and conversations with “ghosts”. What: If you prefer your artwork in a more luxe setting than Art Central or even Art Basel itself, then the Asia Contemporary Art Show will be a bit more your speed. This art show is taking over four floors of the five-star Conrad Hong Kong hotel. Over 2,000 pieces will be presented across 85 spaces and include work from some of the world’s most promising contemporary artists. What: For those who like it fancy and need a bit of time away from the island (or just like life on the ‘dark’ side), the Kowloon Peninsula has another option for your yearly dose of art & culture. With artwork spread amongst some of the Peninsula’s rooms, maybe you can check-in and have some fun in a tub. What: You didn’t actually think we’d leave this off the list, did you? Art Basel is the cultural event of the year! With eight different exhibitions and sectors to explore including “Encounters”, a series of large-scale sculptures and installations, and “Conversations”, where you are offered a platform for dialogues with prominent members of the international art world, Art Basel should not be missed. And seriously, we dare you to see every piece.